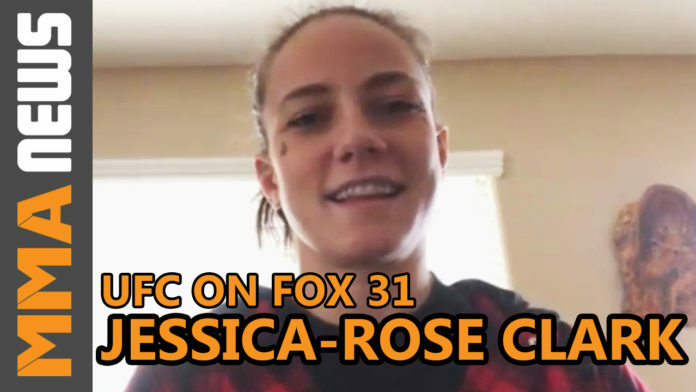 Jessica-Rose Clark looks to go back-to-back to her roots when she steps into the cage on Dec. 15 opposite Andrea Lee at UFC on FOX 31. But outside the cage she’s made some major changes that she hopes will not only make her a better fighter, but a better person. Suffering her first loss in the UFC back in June, the 30-year-old took a step back and identified some of the problems that led to that unanimous decision setback against Jessica Eye. Clark (9-5) lost for the first time since Mar. 2017 and snapped her three-fight win streak in the process. Prior to that, the Invicta FC veteran had defeated Bec Rawlings and Paige VanZant in the octagon. One of the other big changes she’s made this camp is quitting alcohol. Instead of going out and partying, she’s traded wine for video games. UFC on FOX 31 takes place Dec. 15 at at Wisconsin Entertainment and Sports Center in Milwaukee, Wisconsin. The main event features a lightweight rematch pitting Kevin Lee against Al Iaquinta.